In a video shot by Dr. Nguyen Thanh Nam, Deputy Director at a hospital in Ha Giang, and shared with the patient’s consent, you can see the six-inch leech wriggling on a medical tray after being removed from the woman’s throat. It’s unclear exactly how it got there, but doctors suspect that the unnamed woman accidentally ingested it while bathing in or drinking spring water. Judging by the duration of the symptoms described by the patient, Dr. Thanh Nam estimates that the blood-sucking parasite must have been living in the woman’s throat for at least 3 months. Doctors said that this kind of case is extremely rare and tough to diagnose properly. If not removed, the leech could have moved up the woman’s sinuses and caused excruciating headaches and facial pain, or could have moved towards the larynx, causing life-threatening breathing problems. This isn’t the first time we’ve seen a leech thriving inside a person’s body. 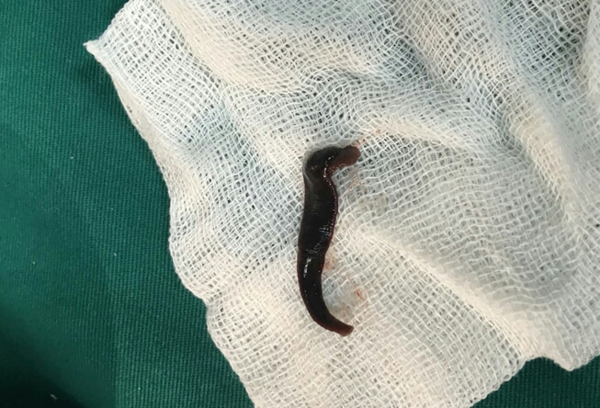 Just last Fall we reported about a similar medical case in China, where doctors removed a leech that had been living inside a man’s nostril for three months.